Large and wide-necked bifurcation aneurysms remain technically challenging to treat by the endovascular approach. Several endovascular strategies have been established in recent years for treating wide-necked bifurcation aneurysms, such as balloon-assisted coiling, stent-assisted coiling, waffle cone technique (WCT), and intrasaccular flow disruptors. A 64-year-old woman was diagnosed with three intracranial aneurysms of the right and left middle cerebral artery and right internal carotid artery. She was qualified for endovascular treatment of the left middle cerebral artery (LMCA) aneurysm because it posed the greatest risk of rupture. Due to complicated morphology, a pCONus stent and coils were chosen for treatment. Three months later the right middle cerebral artery aneurysm was embolised and the woman was scheduled for second-stage treatment of the LMCA aneurysm. One week before the planned admission the woman was diagnosed with subarachnoid haemorrhage (SAH) in the region of the previously treated LMCA aneurysm, and the second-stage treatment was conducted with a good result. The woman was discharged in improved condition. Three months later the woman was once again admitted with SAH – an enlarged LMCA aneurysm was observed and immediate third-stage embolisation was performed, but due to complications of SAH the woman eventually died. 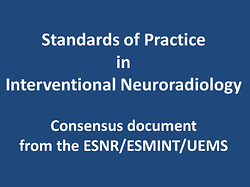 On the basis of the presented case we would like to emphasise the importance of sufficient initial coil packing and frequent control of neck region of the aneurysm for the long-term stability and safety after pCONus-assisted coiling of intracranial aneurysms.